Chateau / Country House3552 sq. ft.
A beautifully renovated half-timbered house, transformed into a place of wellbeing and Erholens. Enjoy nature away from daily life, from the hustle and bustle. Here the children can romp undisturbed in the garden, while you can enjoy the sun and the view of the Black Forest in a deck chair. In summer the garden invites you to a barbecue. After exhausting trips to enjoy the outdoor sauna (with space for up to eight people) and relax in the whirlpool. The house is comfortably furnished. It is with a size of 330 m² and many Sleeps suitable not only for families, but also friends who want to holiday together. 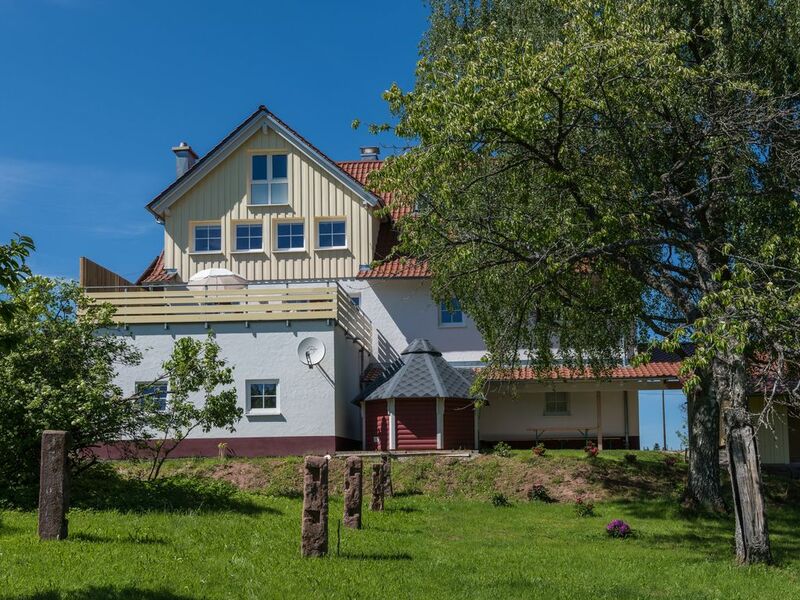 Very large holiday home with a lot of half-timbering inside and very large comfort. Big garden with playground. Whirlpool and great outdoor sauna. The house is located in a small and peaceful village in the Northern Black Forest. It is huge. Perfect for a big group/family. It is equipped with everything (incliding a nice sauna) and all the equipment worked perfectly. Big kitchen, nice dining room, good beds. Highly recommended. Thanks a lot for your Review. We are very happy that you enjoyed your stay in our vacation home in the Blackforest. All the best. We had a great time in a great house. Lots of rooms, the beds are good, very good bathrooms, nice sauna. And a fantastic garden. Thanks a lot for your Review. We are very happy that you enjoyed this very Special place in the beautiful Black forest. Ideal für ein Wochenende/Urlaub mit Freunden oder Familie. Alles hat gepasst. Schöne Sauna, Terrasse und schöner Whirlpool. Die Vermieter Fam. Roth sind sehr freundlich, entgegenkommend und unkompliziert. Es hat alles tadellos geklappt , jederzeit wieder! Der Urlaub im Schwarzwald hat uns sehr gefallen. Vielen Dank für Ihre Bewertung. Es freut uns das die Ruhe und schöne Lage vom Landhaus sowie die Ausstattung mit Sauna und Whirlpool Ihnen gefallen hat. Mooie en praktische woning voor een grote familie. Mooie ligging op loopafstand van meer. Alles is aanwezig voor een prettig verblijf en om zelf te koken. Thank you very much for your Review. we are very happy that you enjoyed your stay. Wobei wir mit 5 Pärrchen, 2 Einzelpersonen und 2 Kindern an die Grenzen der Schlafräume gekommen sind. Auch zum Essen hätten es nicht mehr Leute sein sollen. Vielen Dank für Ihre Rezension und Bewertung. Das hat uns sehr gefreut. Vom Schlafplatz her gibt es gerade für Familien mit Kindern einen großen Raum mit 5 Schlafcouchen für bis zu 10 Personen. Das lieben viele Kinder. Für größere Familien gibt es noch einen Ausklapptisch für 4 weitere Personen. Ev. wurde der nicht genutzt? Seewald-Schernbach is a gem in the Black Forest. Quiet and beautifully located near the bathing lake Erzgrube or Nagoldtalsperre called. Just the thing for a quiet relaxed family holiday with many opportunities for things to do.